While The Hussar Grill remains one of the country’s premier grill rooms – it has four restaurants in the Eat Out Top 150 as well as an award winning wine list – it proudly continues to offer its growing community of loyal customers an outstanding value proposition. Although it is widely known for outstanding steaks, The Hussar Grill is also much loved for its famous complimentary snacks on arrival, comprising marinated olives and batch-cooked house crisps, and irresistible seasonal specials. This summer is no exception. Available Monday to Saturday from 12h00 to 17h00, the two-course summer lunch special at The Hussar Grill lets patrons enjoy an incredible starter and main course combination at R130 per head. As an introduction to your meal, choose from a trio of delicious options. For vegetarians, there’s tomato soup with cream, served with croutes on the side. Or, peri-peri chicken livers sautéed in a decadent combination of sherry, garlic, onions, mixed herbs, and cream, also served with croutes. Alternatively, try the starter portion of tender fried calamari strips. The main course options make it even more difficult to choose. A 200g Class A rump or sirloin steak is served with traditional fries, mash or baby potatoes. Poultry lovers can opt for the parmesan chicken breasts nestled on a bed of creamy mashed potato. Or choose the main portion of fried calamari served with tartar sauce. The two-course special is best enjoyed with a glass of The Hussar Grill’s own 50 th Anniversary Red Wine at R50 per glass or R150 per bottle. Of course, guests are still welcome to bring their own wines and bubbly to enjoy at the restaurant with their meal – none of The Hussar Grill restaurants levy a corkage fee. You can enhance your two-course experience further by ordering sides such as creamed spinach or salad, or even a Pepper Sauce to go with your expertly grilled steak. Top it off with a delicious dessert such as baked cheesecake, crème brûlée, malva pudding, chocolate fondant, chocolate vodka or ice cream and chocolate sauce. Because these optional extras are not part of the two-course summer special, they are charged for separately, but guests are welcome to order beyond the confines of the set menu. 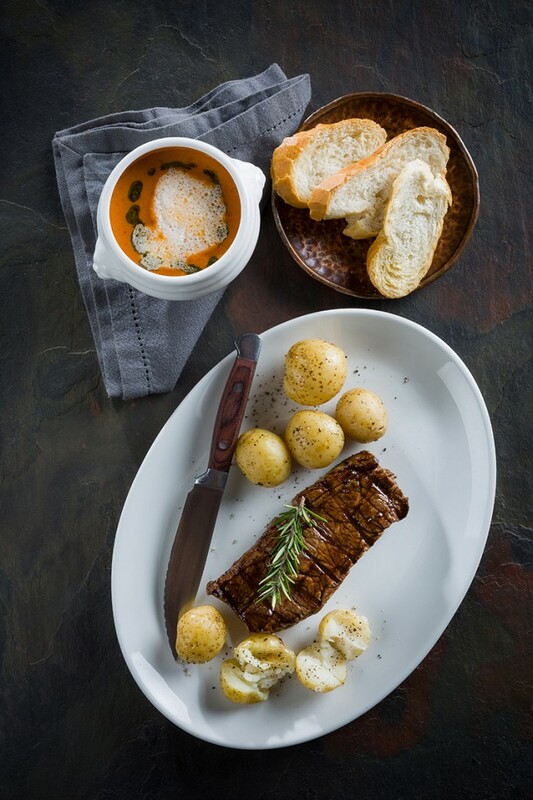 The two-course summer lunch special runs until 30 March 2019 and is available at all The Hussar Grill restaurants that are open during lunch time (select outlets, such as Camps Bay, are open during the evenings only). For more information on The Hussar Grill, please visit www.hussargrill.co.za. To book a table at The Hussar Grill – where every meal is a masterclass – please use the Dineplan App, available via the App Store and Google Play. The Hussar Grill Makes the Eat Out 500 not once, but four times ! Joining restaurants across the globe, CHEFS dishes up French cuisine as part of the Gout de France culinary celebrations!